Online peer-to-peer (P2P) lending platform i2ifunding has raised Rs 2 crore (around $300,000) from a group of angel investors. Two angel investors from Mumbai and one Indian investor based in Japan have participated in this round, Vaibhav Kumar Pandey, co-founder, i2ifunding, told Techcircle.in. However, he declined to name the investors but said they have committed to a follow-on round. The funds will be used for towards technology expansion and also towards increasing its presence geographically. "The investment could not have come at a better time as RBI has talked about Rs 2 crore capital requirement for P2P players in the concept paper recently released for regulating P2P lending platforms in India. This funding would mean that we would be able to clear this requirement easily," said Pandey. i2ifunding is an online marketplace that connects verified borrowers looking for unsecured personal loans with lenders looking for high-return investment options. It mainly focuses on salaried borrowers. The firm claims to have more than 1200 registered users on the platform. "We currently have investors from all across the country; however borrowers are limited to Delhi-NCR, Mumbai and Bangalore. Our target is to expand to at least top 20 cities of India in the next one year," said Manisha Bansal, co-founder and strategy head, i2ifunding. In a bid to regulate P2P lending marketplaces, RBI on April 28 had proposed registering these platforms as non-banking financial companies (NBFCs) and a minimum capital requirement of Rs 2 crore for such entities. It has sought feedback from the public by May 31. Lately, a number of startups connecting individual borrowers or small businesses with lenders via a digital platform have come up in the last few months. In the peer-to-peer lending space, LoanZen Pvt Ltd raised an undisclosed amount in seed funding from angel investors in February through Tracxn Syndicate, an angel network launched by Tracxn. The same month, Wiseworks Technology Pvt. 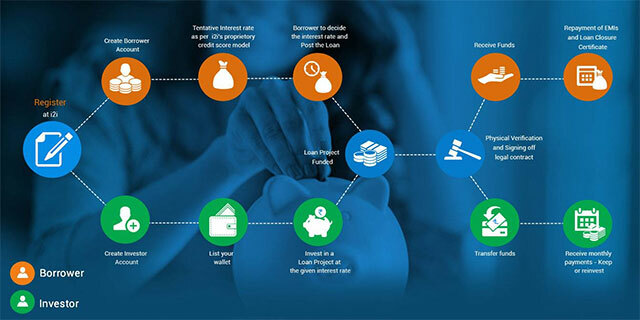 Ltd, which runs digital lending platform Capzest, raised $200,000 in a seed funding round led by Lion Ventures. Online lending marketplace KountMoney raised an undisclosed amount in seed funding in November 2015. Loanbaba raised $320,000 in seed funding the same month. IndiaLends, an online marketplace that connects lenders and borrowers for unsecured loans, raised $1 million in October last year. Also in October, P2P lending marketplace Faircent received an undisclosed amount of investment from Aarin Capital Partners.